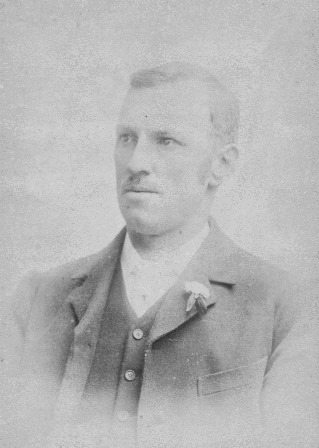 Harry Cooper was born in the Geelong district of Victoria in 1860. His parents were recent emigrants from Birmingham in England. They lived and worked in the Colac and Camperdown region of Victoria (near Geelong) with father Joseph a builder, an undertaker and a butcher. Harry moved to Tasmania sometime before his marriage on 30 December 1890 at St John's Church of England, New Town to Elizabeth Annie (Bessie) Barlow. At this time he was 31 years old and working as a butcher. Ada, Charles, Marion and William Barlow (all siblings of Bessie) were attendants at the wedding. 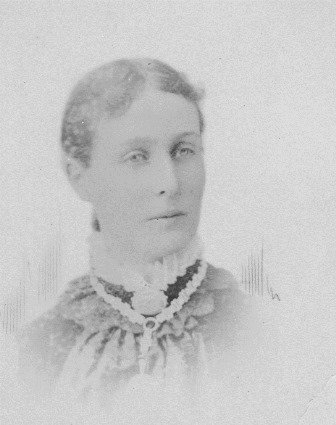 Bessie wore her mother Elizabeth's 1860 Irish lace wedding veil which is a family heirloom that was worn by a number of her descendants between 1860 and 1977. 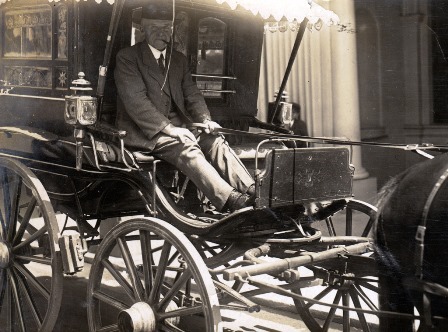 Harry was a member of the New Town Council in 1897 and then established a horse coaching company with his brother Joe. It was known as Cooper Bros and operated in and around Hobart and as far south as Geeveston. Horses always played a big part in the Cooper family with Joe being "Clerk of the Course" at Elwick Racetrack and he and sister Ada, competing in horse racing events at local Tasmanian agricultural shows. Between 1910 and 1915, Harry and Bessie lived in Geeveston in the Huon Valley. 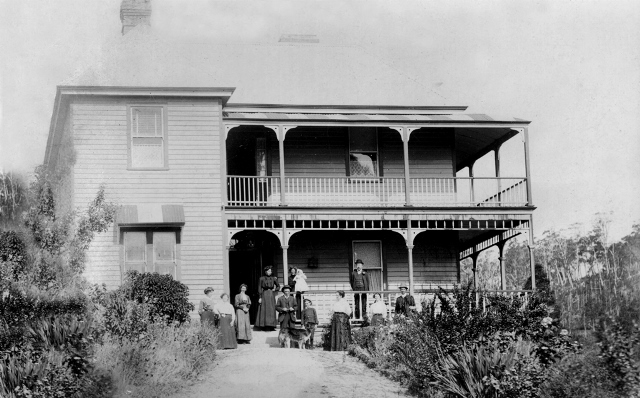 They ran a 25 room boarding house called "Hillcrest" which is situated on the main road to Huon. The photo c1911 shows Harry, Bessie, their children Adie and William and other relatives, on the front steps of the house. Between 1911 and 1914 Harry made a number of unsuccesfull applications to turn Hillcrest into a hotel. It never eventuated and I wonder did he leave Geeveston because he became disenchanted after so many attempts? Harry Cooper, for a house situated at Geeveston, and intended to be known by the sign of "The Hill Crest Hotel." Hillcrest was built in the 1860s and became a popular place for tourists to stay. Over the years it enjoyed hosting anglers, walkers and adventurers but eventually became very run down. Fortunately in recent years it has been beautifully restored and now looks a picture sitting on the hill in Geeveston. After packing up in Geeveston, Harry and Bessie and the children moved to the Lower Midlands where he bought a farm at Stonor. According to historian and author JS Weeding, Stonor Park was a vast estate in the 19th century but in 1920 it was subdivided for Closer Settlement and Harry bought 420 acres. Harry died in May 1923 and was buried at Cornelian Bay Cemetery in the Church of England section DD lot no 300. His wife Bessie lived until 1935 and is buried with Harry. There are no memorial plaques on their grave site which seems quite sad. Perhaps this is something the family could do for them in the future. As far as I know my family are the only living descendants of Harry and Bessie. Harry's will (10 May 1922) mentioned that as well as the farm (and equipment and livestock) at Stonor he also owned four cottages in Carr St. North Hobart. Bessie was living in one of these (no 24) at the time of her death. These cottages adjoined his brother Joe's property. I recall my mother saying the family at one time owned a "street" in New Town!